The Georgia O’Keeffe Museum in Santa Fe, New Mexico, houses some 140 oil paintings by the iconic American artist, along with thousands of additional works from O’Keeffe’s prolific career. But the oil paintings have been developing tiny pin-sized blisters, almost like acne, for decades. Conservationists and scholars initially assumed they were grains of sand trapped in the paint. But then the protrusions grew, spread, and started flaking off, leading to mounting concern. 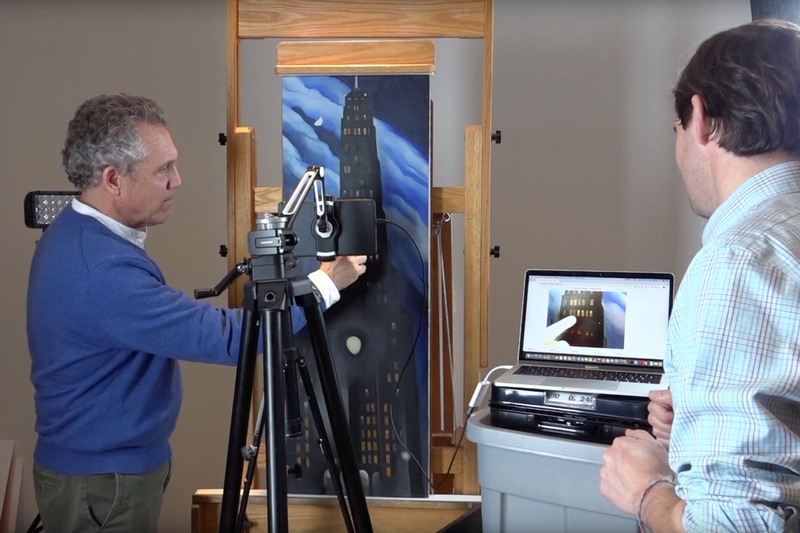 Now an interdisciplinary team of scientists from Northwestern University is studying this mysterious “paint disease,” using a low-cost, portable tool that allows the scientists to image the surface of the paintings quickly and easily with a smartphone or a tablet. They demonstrated the new technique last week at the American Association for the Advancement of Science conference in Washington, DC. This “paint disease” isn’t limited to O’Keeffe’s oeuvre. Conservators have found similar deterioration in oil-based masterpieces across all time periods, including works by Rembrandt. Chemists concluded that the blisters are actually metal carboxylate soaps, the result of a chemical reaction between metal ions in the lead and zinc pigments and fatty acids in the binding medium used in the paint. The soaps start to clump together to form the blisters and migrate through the paint film. “They can form exudates on the surface, which obscure the painting itself, creating an insoluble film, or an effect of transparency, so you can look through those layers, which was not the intention of the artist,” said Marc Walton of Northwestern University, who co-led the study.